Calligraphy is a craft. It involves designing alphabets and drawing them by hand with the use of broad tip instruments like qalams (a pen made of dried reed or bamboo), brushes, metallic pens dipped in ink. The legacy of handcrafted scripts goes back to ancient times. Before the invention of paper, calligraphers would draw on materials such as rocks, textiles, metal, palm leaf, and leather. The advent of paper revolutionised calligraphy. Now, in this digital age, calligraphy has been replaced by graphic designs which can be produced in bulk in a fraction of the time that calligraphers of yesteryears took. Modern calligraphy ranges from inscriptions in hand lettered texts, such as event invitations, to designs for logos and fine-art objects with inscriptions on cut-stone. 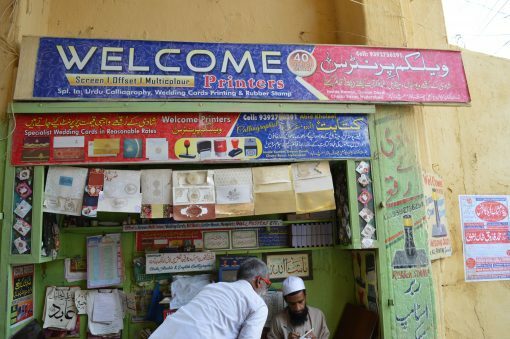 There are a few cities in India where calligraphers can still be found — like Delhi, Hyderabad, and Lucknow. Continuing with their trade, they are keeping the tradition alive. On a pleasant Friday afternoon, I decided to visit Chatta Bazaar in Hyderabad, a short walk away from the Charminar. The bazaar lies just beyond an old stone kaman, an archway. One of the oldest market areas in Hyderabad, Chatta Bazaar is now known for its printing presses and calligraphers. Invitation cards to wedding, naming ceremonies, birthdays; visiting cards in Urdu, English Arabic; all of these, with beautiful calligraphy, greet you from every other shop. Calligraphy is an important element of Islamic art. It has been a part of Hyderabad’s heritage for centuries now. Examples of Islamic calligraphy can be found in museums, palaces, tombs, dargahs, and hamams. For instance, a Quran handwritten by Aurangzeb is on display at the Telangana State Archeology Museum; another handwritten Quran gifted to the last Nizam of Hyderabad is on display at his Exalted Highness the Nizam’s Museum in Purani Havelli. My first stop here is at “Welcome Printers”. This shop is run by Abid and Nauman. The latter, Nauman, is much sought after for his beautiful hand-written texts, primarily in Urdu and English. As I enter the shop, I see he is busy working on an invitation card using khattati (old Urdu calligraphy). Dipping his qalam in a waterproof ink after every few strokes, he appears completely engrossed in his work. But a few minutes of observing him reveal that he’s very alert to his client’s suggestions even as he does calligraphy; the client looks on over his shoulders as he works. Nauman is quick: when the client asks him to correct some letters, he readily makes the corrections. He uses a blade to chip away at the thick paper. This is the traditional way of “erasing” ink; it’s a way in which the word is redone correctly. A glance through the shop reveals a variety of cards arranged on shelves, with rows of pens, writing pads, tipped nibs, and handles laid out neatly on the desk. I am told that Nauman is new to the marker and is still learning calligraphy under the guidance of Khaleel Abid Saheb. In fact, he works out of Abid Saheb’s shop. Muhammad Abdul Khaleel Abid, or Abid Saheb, as he is fondly known, is a traditional calligrapher. He learnt the art from his father Muhammad Rasheed, who used to work at Siasat, an old, well-known publishing house in Hyderabad. Master Rasheed, as Abid Saheb’s father was known, would design and write cards, invitations, notes, and farmans (orders) in beautiful calligraphy for the upper classes. 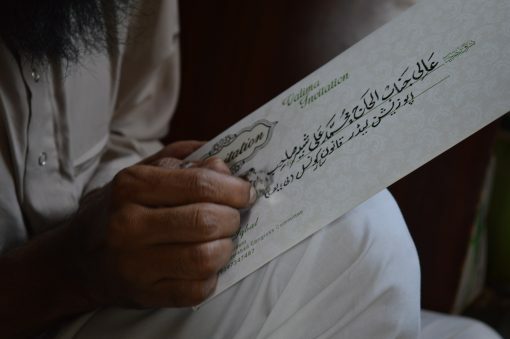 People of Hyderabad still like the names on invitation cards to be written in hand by calligraphers. Abid Saheb followed in his father’s footsteps. He tells me that, earlier, baru ka qalam (pens made out of bamboo) were preferred; this, coupled with siyahi (ink) — that was made from powders especially brought in from Kanpur — yielded the best results. Traditionally, siyahi was not black in colour (as it is commonly now); it was brown, like brewed tea. 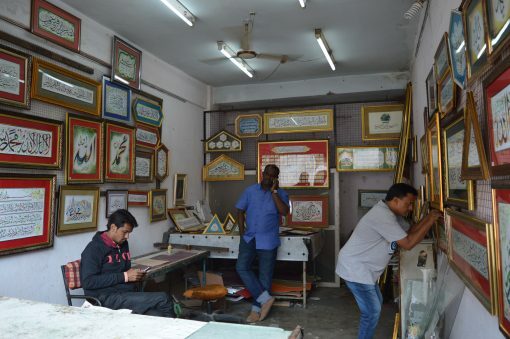 “I’ve been running this shop, doing calligraphy, for the last forty years now,” says Abid Saheb. He still prefers using the traditional tools and techniques that were handmade. Increasingly now, the other calligraphers are turning to nibs, pens, and ready-made qalams for ease and comfort. A short distance away, Muhammad Naim Sabri and his son’s work can be seen nailed on the walls of another calligraphy showroom and studio. On entering, I am greeted by a multi-colored calligraphic work with a signature nailed on the wall right in front of the entrance. This is the handiwork of the older Muhammad Naim Sabri, the senior most master calligrapher in Hyderabad now. He is also an artist and has made many drawings and paintings. In fact, he went for a short stint to the J J School of Arts in Mumbai. He is remembered for the annual calligraphy summer camps that he conducted by Siasat. Given the quality of his work, commissions and requests for work pour in from around world. I was fortunate enough to get a chance to go through his old album; it had some exquisite drawings, portraits, sketches, and studies. I was told that not many have seen his works, and neither does he wish to make this work public, as human portraiture is frowned upon in their culture. Sabri Saheb had learnt calligraphy from Mahboob Ali Athar, a renowned calligrapher from Osmania University in the city. An employee of the Central Public Works Department for forty years, Sabri Saheb also practiced and worked as an architect. It was after his retirement that he set up his shop in Chatta Bazaar some 30 years ago. Two of his three sons also work as calligraphers; the third one is an architect. His sons, Muhammad Faheem, and Zainul Abedin, are also quite gifted; their amazing calligraphic work is displayed on the walls. Unfortunately, Sabri Saheb, now in his 90s, had a stroke and is unable to join them at work, leaving it up to the two sons to run the shop. The tiny room where Zainul Abedin rests is cramped with two cupboards, a few stools, a big table with drawers, a jaanamaaz (prayer mat), rulers of different sizes, bamboos waiting to be carved into qalams, nibs, paper cutters, mounting sheets, rough papers, pen holders, brushes, pencils, and half-done calligraphies. This is their studio. A sherwani hung by the door; the room’s walls were covered with beautifully framed national and international calligraphy certificates. “The room has seen some hectic, busy days,” the sons tell me with a tinge of pain. “Baba loved this sherwani. 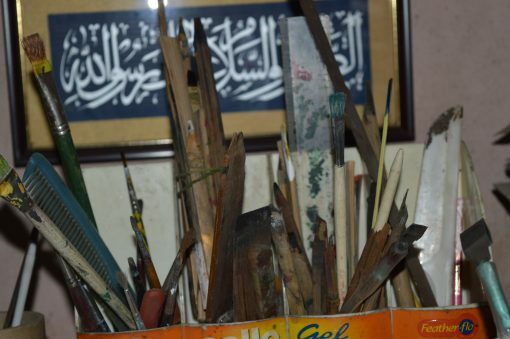 We leave this hanging here as a symbol of his presence.” All of Sabri Saheb’s tools — a range of nibs, pens of different sizes and quality, special inks, and paper that he liked to use for his work — are all laid out neatly in the studio. His sons bring out a file to show me some of his old calligraphies, his certificates, and some old handmade qalams that he used. His son Faheem prefers to do calligraphy in English, although he also writes in Urdu when required. “I cannot write read Urdu. But I recognise the alphabets so I can work if someone writes the text,” he admitted. The next shop belongs to the same family; it is here that they sell their work. Everyone looks equally; various kinds of calligraphies are on display. Faheem tells me that most of these are his father’s original works; others are copies made by them, some are designs collected by their father (these were only meant for display purposes), while the rest are only for prints. They tell me that people from as far as Saudi, Jeddah, England, Turkey, Istanbul, and America commissioned their father’s work. Now, however, their main sources of income are visiting cards, wedding cards, and birthday cards, which, Faheem admits, is not really calligraphy. Just before I leave, I see Faheem take up a qalam, and dipping it in colour. He holds it over a clear white sheet of paper for a second, before covering the paper in beautiful calligraphy with a few deft strokes. Shaista Anwar has completed her masters from University of Hyderabad and Heidelberg University, currently working with The Raza Foundation and guest lecturar at National School of Fashion Technology. Research interests lie in the field of Islamic art and architecture, Islamic philosophy and Indian crafts.